Can. 1249 The divine law binds all the Christian faithful to do penance each in his or her own way. 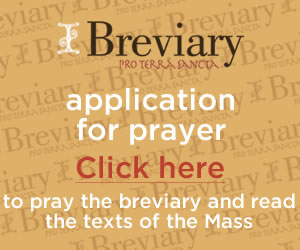 In order for all to be united among themselves by some common observance of penance, however, penitential days are prescribed on which the Christian faithful devote themselves in a special way to prayer, perform works of piety and charity, and deny themselves by fulfilling their own obligations more faithfully and especially by observing fast and abstinence, according to the norm of the following canons. Let the bacon be served. 28. In summary, let it not be said that by this action, implementing the spirit of renewal coming out of the Council, we have abolished Friday, repudiated the holy traditions of our fathers, or diminished the insistence of the Church on the fact of sin and the need for penance. Rather, let it be proved by the spirit in which we enter upon prayer and penance, not excluding fast and abstinence freely chosen, that these present decisions and recommendations of this conference of bishops will herald a new birth of loving faith and more profound penitential conversion, by both of which we become one with Christ, mature sons of God, and servants of God’s people. The whole document is worth reading. But not tomorrow! On solemnities, we feast. My dog and I, therefore, are no typological figures of Marian intercession, get that idea out of your head right now. Yes, Jesus would let the dog out if Mary told Him to. But no, Jesus isn’t too busy showing St. Joseph the Russian Priests with Cats Calendar that he fails to notice the dog needs to pee, that’s not what it’s about. There are other reasons asking Mary to intercede for you is a good, noble, worthwhile part of a healthy Christian lifestyle, and we’ll leave it at that for now. The Immaculate Conceptions is about the order of things. It is about the re-ordering of broken humanity. For the new Adam we have a new Eve. Curiously, the new Eve isn’t the wife of the man about to fall, but the mother of God-made-man who’s going to save you from your fall. Humans, fallen as we are, tend to overlook the order of things. We have a picture in our heads of how things stand, and when reality doesn’t match that picture, we tend to elbow aside reality and stick with our imaginary world, the one we made, not the one God made. The one we prefer, because we’re at the center of it, little gods with our little fake worlds. The dog, in contrast, lives in no such imaginary world. She needs to be let out at night, so she has a pressing interest in understanding the real order of things. I’ve written about the Immaculate Conception at least one other place: The Catholic Mom’s Prayer Companion. At this writing, Google Books is including what I have to say in the preview-pages for that book. This time last year, I reviewed a coloring book. For those of you who were worried about it, I’ve since purchased felt-tip markers. 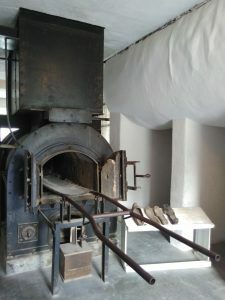 I’m no longer actively blogging there, but I have some good perennial posts for catechists in the archives at Amazing Catechists. 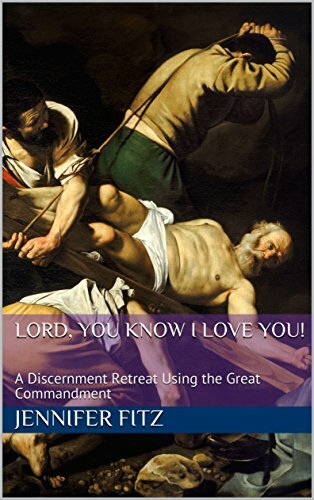 If you know a catechist who’s about to quit in despair, you might consider investing a few dollars in my purple book of how not to die in agonies teaching religious ed to a room full of hooligans. The publisher gave it a more formal title, but you can call it that. Our Lady of Visible Forebearance is my preferred image for this week’s feast. Via Wikimedia, Public Domain. Her whole life she never ate bacon, and now she rejoices in heaven with many crowns, and presumably also all the bacon she wants. Which of Your Friends are Going to Hell? Someone both lovable and known-to-be-sinful died recently, and a friend posed this question: What does the Church teach about so-and-so? Is this person now in hell? The Church will very occasionally confirm that someone is in heaven, but never makes a judgement on who is in hell. We can know that certain sins will mortally wound the life of the soul if they are freely chosen by someone who understands their gravity. We cannot know the inner life of another person, and therefore cannot know how culpable they are for a given sin, nor whether they repented (if necessary). Heck, we barely scratch the surface on our *own* inner lives. We can, in contrast, appreciate all that is true, good & beautiful in the people around us. And for those who have been pondering the blog silence of late (including a few overdue book reviews, sorry there): It’s due to a distinct lack of death in these parts. Camping, volleyball, children studying music, adults studying the Bible, children and adults putting on an All Saints Play, a writer posing as a literature teacher beginning this Friday, friends visiting from out of town, friends visiting from in town, a Quiz Bowl around the corner — life is good. Unless you want to be taken for a ride. A long ride up a windy mountain road, and then back again by a different way, with a stop for photos in a picturesque village because it isn’t fair that the children get to take all the photos out their windows while I keep my eyes on the road, so humor me we are going to stop and park so the mother can get out and take pictures . . . 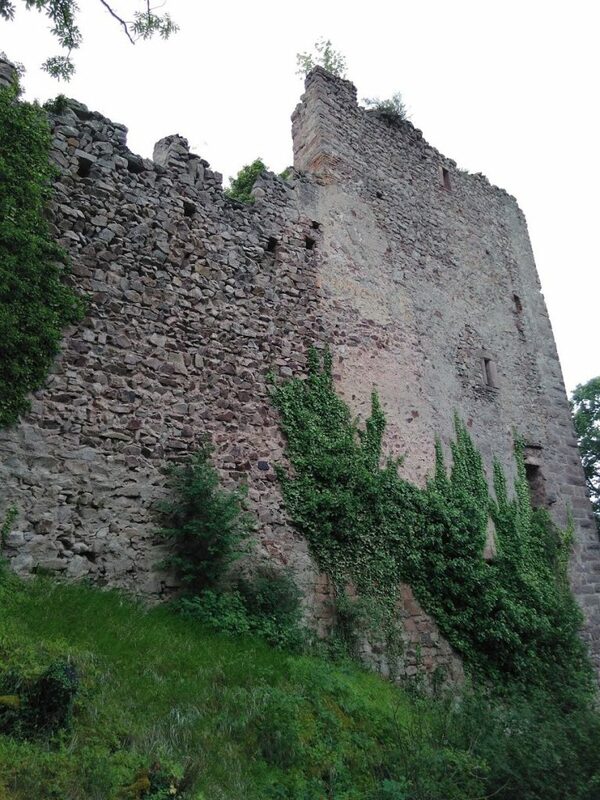 Eventually we did end up in Katzenthal (also picturesque), home of the Château de Wineck. 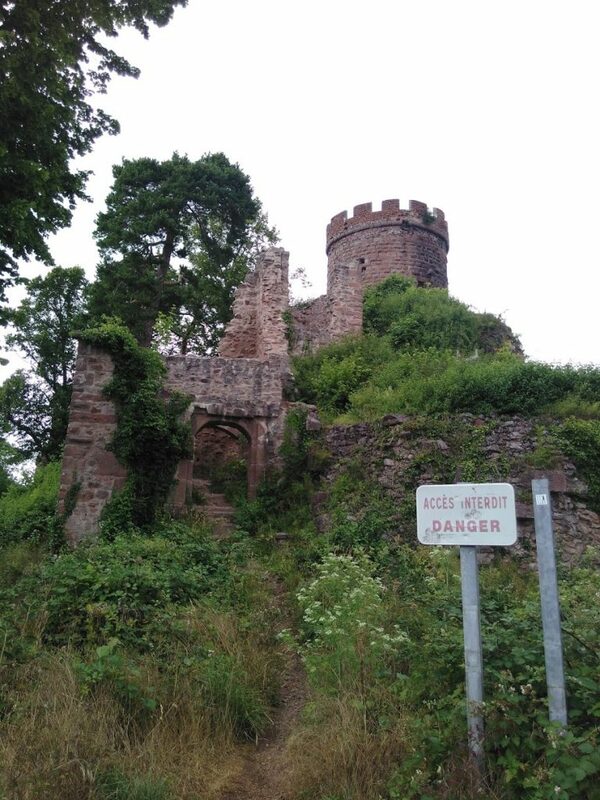 FYI, Wikipedia seems confused about this castle, in both French and English. 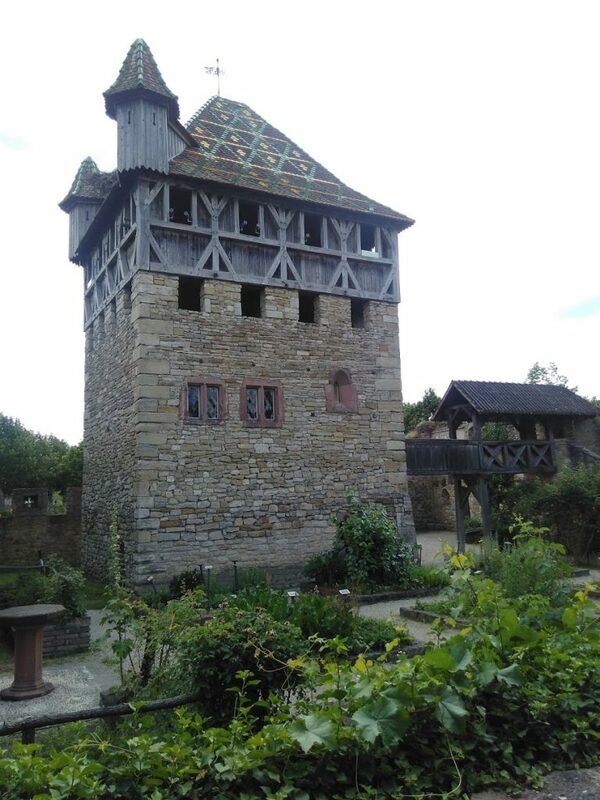 The place we visited, as you’ll see, is the one I’ve linked to — hit the Google translate button and scroll down for some history. We loaded up and headed towards where I’d left them. The “road” begins with a teeny-tiny alley between two buildings, ample for pedestrians and more than sufficient for those narrow tractors that the farmers drive through the vinyards, but not the sort of place Americans drive automobiles. Warnings from the rental contract flashed in my head. Conveniently, I have rented a French car. It knows the way French drivers behave, and so it has sensors that beep ruthlessly at you if you get anywhere even vaguely French-like in your parking habits. 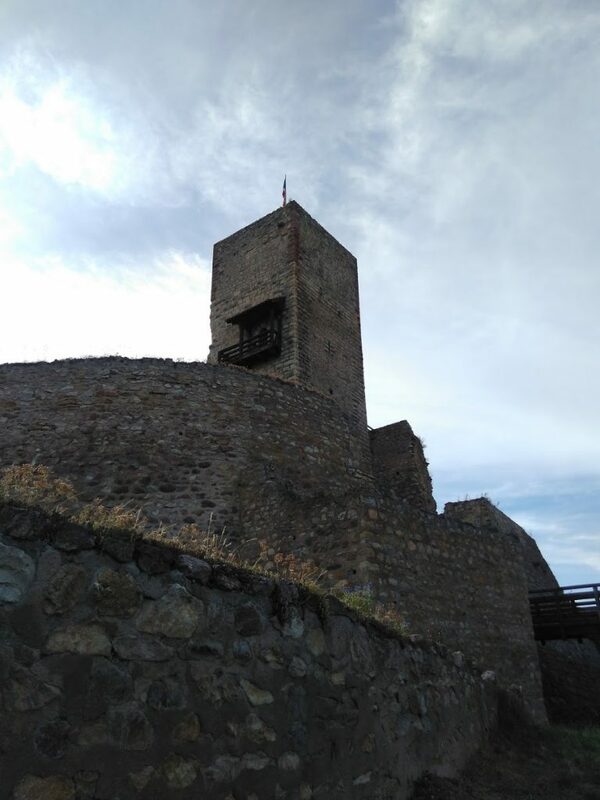 I really wanted to see this castle. Possibly an addiction is forming. So I sucked in my gut (as if that would help) and thought French thoughts, and threaded the needle. No furious beeping. No scratches for the rental car guy to charge to my credit card. Apparently it is a road. Except that the “road” never turned back into a full-sized road. As we wound our way up, I grew increasingly suspicious that I was on a private road belonging to the vinyard owner. 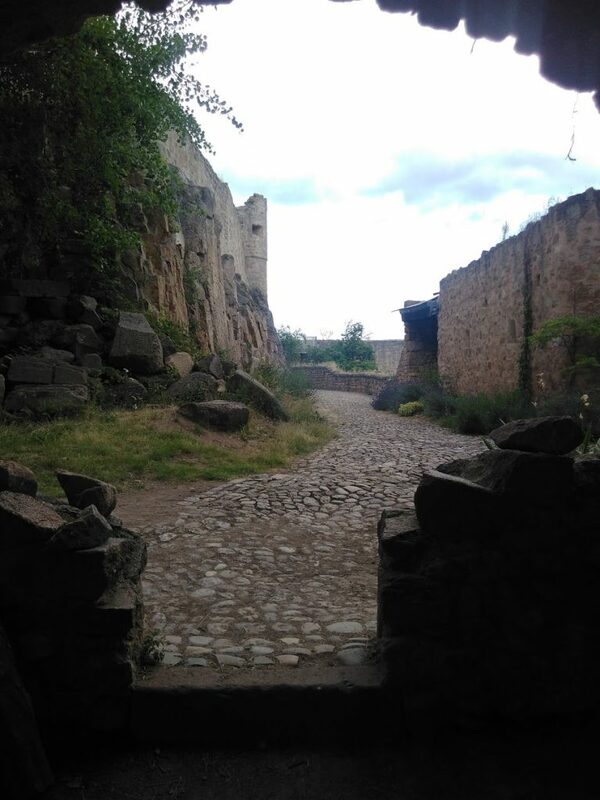 Also: I wanted to see that castle, and anyway there was no place to turn around. So up we drove, and sure enough there was a wide spot for parking right at the castle, and that, too, was probably meant for castle custodians and not for us, but the place was empty because it was late, so if we were supposed to get in trouble the villagers were slacking off on that job. 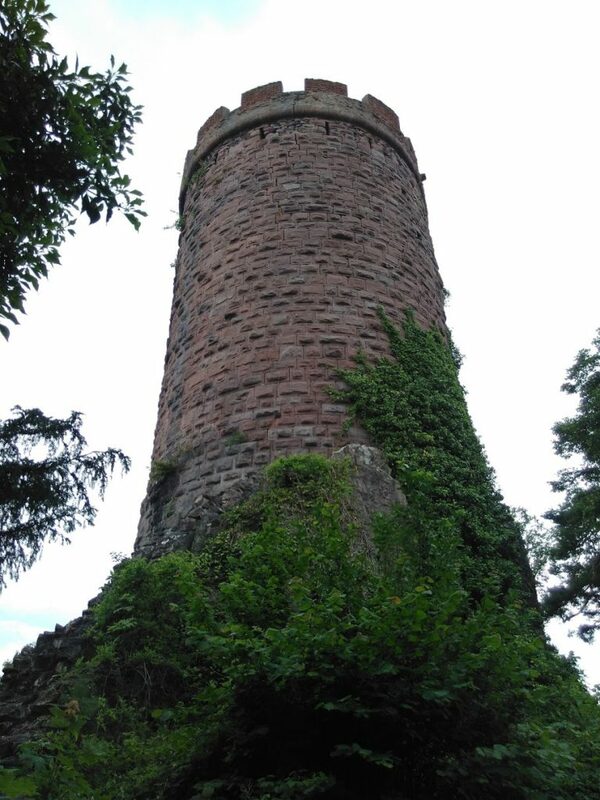 The remains of Wineck are small – here’s the keep and tower. You can go inside on the occasional opening hours, but we declined to trespass (we’re like that — our ambiguous vehicle situation not withstanding). 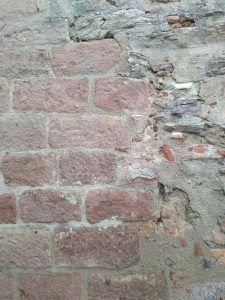 There are some slight but distinct differences, you’ll note, between this wall cross-section and the cross-section of wall from the Eguisheim castles in Part 2 of this series. 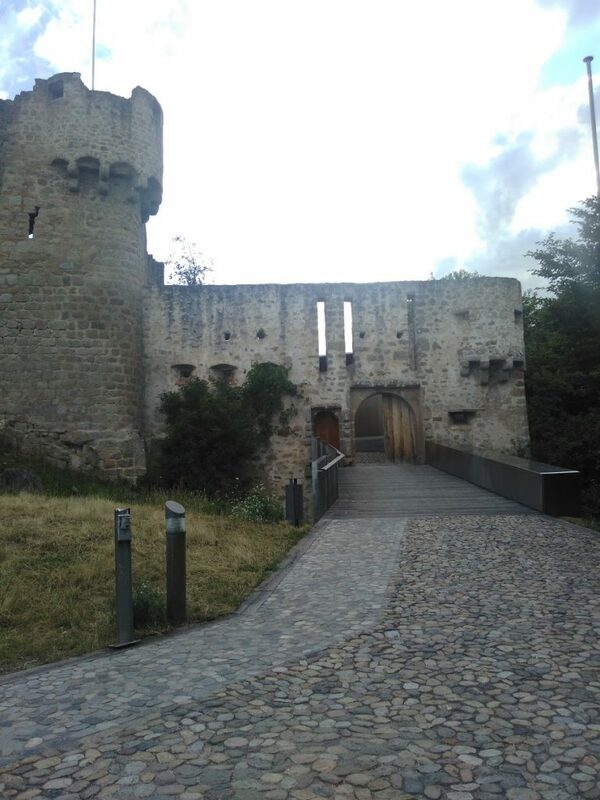 If you are just joining us on the castle tour, Part 1 is here. 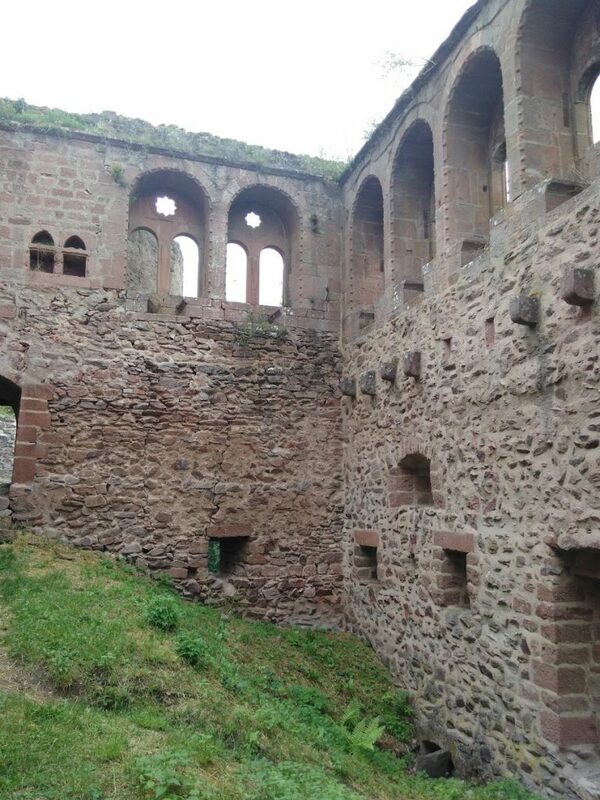 The last thing I have planned for the (Alsatian) castle series is a look at the furnishings in Haut Koenigsbourg, coming next. 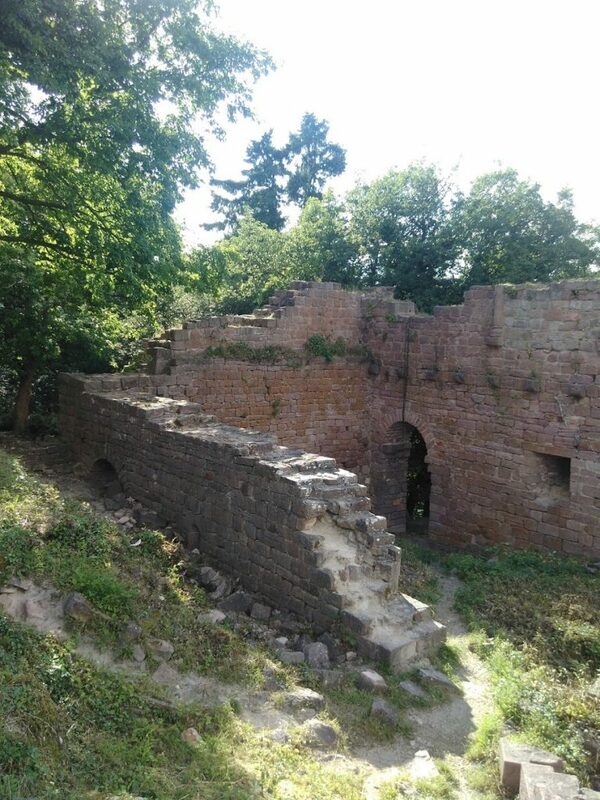 There are no castles at the museum, but there is a strong house – une maison forte – built on site from salvaged 15th century components rescued from Mulhouse. The tower is not a perfect reconstruction. The curators took the remains of the original building parts and gave their best rendering of what it might have been used for, and what would be most interesting or educational for museum-goers. 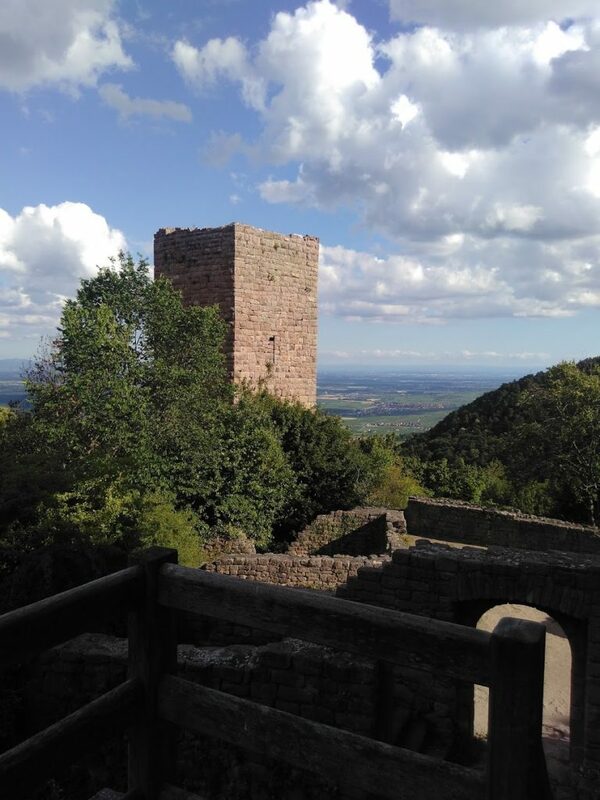 Like Kaiser Wilhelm’s reconstruction of Haut Koenigsbourg, it’s an interpretation, not a replica. 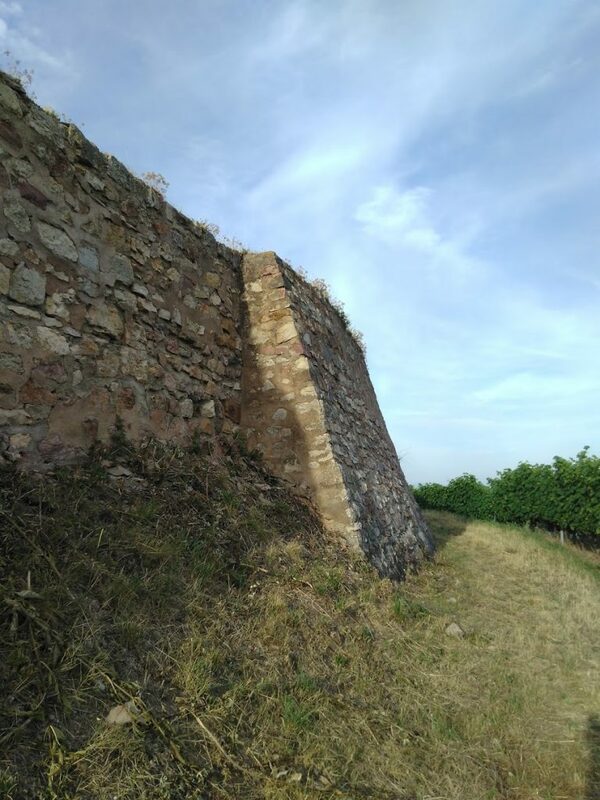 It’s useful for thinking about how fortifications were made for various purposes. After a full day at the museum (topic for another post or two), we drove north towards our home village and of course we spied castles on the western horizon. There was no other choice but to hop off the autoroute and pick a departmental road that pointed in the general direction and try our luck. 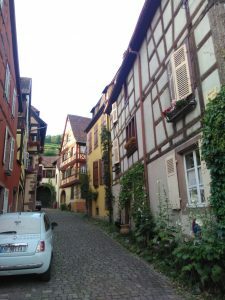 After several missteps we succeeded in the following the promisingly named Route des Cinqs Châteaux to the parking lot for Les Trois-Châteaux du Haut-Eguisheim. 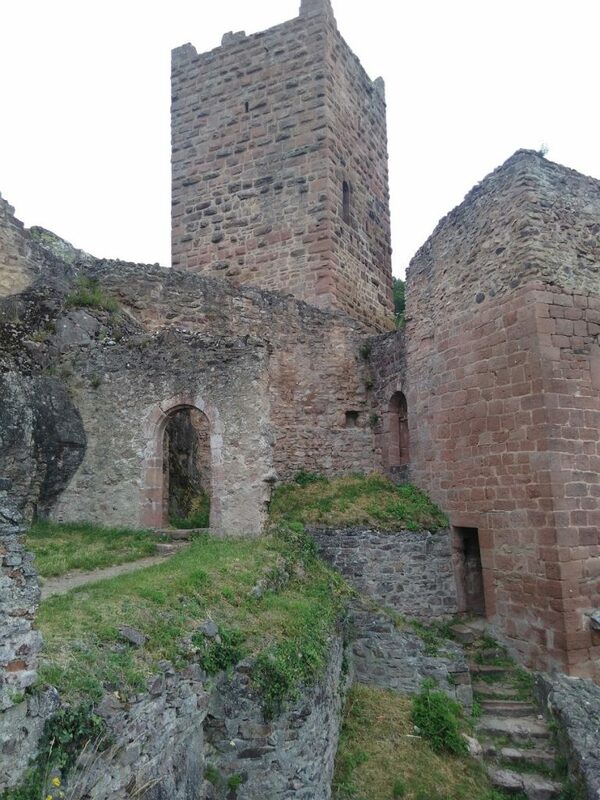 There are two trails out of the parking lot, one of which will take you in five or ten minutes to the three castle ruins above the town of Eguisheim. The other trail will take you all kinds of places far, far, away. It was only obvious in retrospect which trail we should have tried first. Eventually, however, we reached our goal. 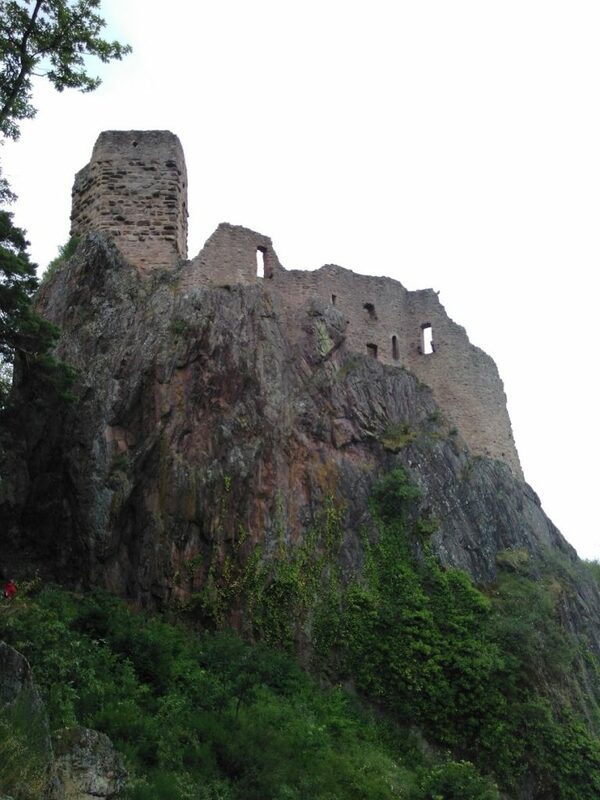 The three castles are right up on top of each other. It’s more like a castle complex. Or one of those castle-subdivisions where the neighbors all complain about how they have no side yard and you can see into each other’s kitchens. It’s enough, though, to make you wonder about the other two châteaux implied by the road name. There was plenty of daylight, so we decided to keep driving up the mountain. 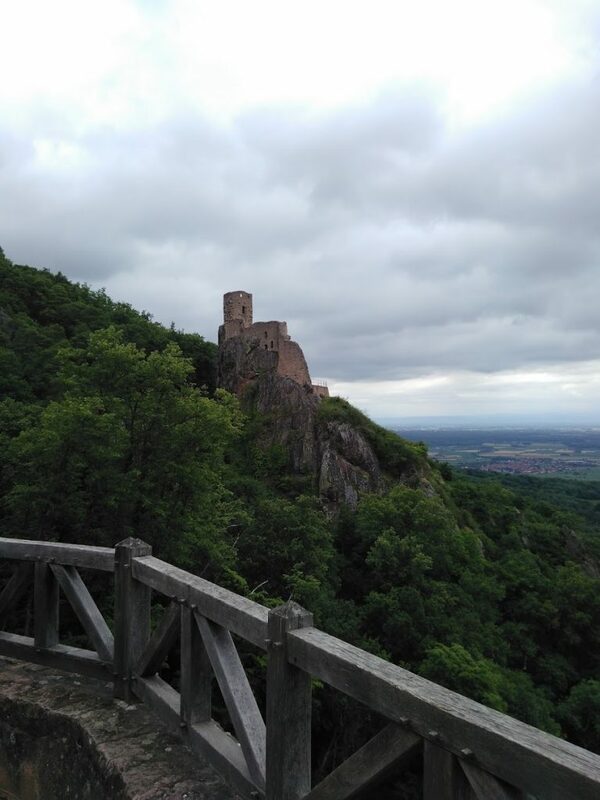 The parking lots at Château du Hohlandsbourg were all packed at 7pm, which at the time we resigned ourselves to hiking up from the farthest of the parking lots seemed like no big deal. What do we know about castle popularity? Wait. Except that we’re looking at a wide open door, right? What you don’t see is the hired security guy whose job is to inform us that under no circumstances can he let us inside, because it is now 7:15, and the castle closes at 7:00, and there’s a big government meeting going on inside. Ah. So that’s why all the parking lots are full. 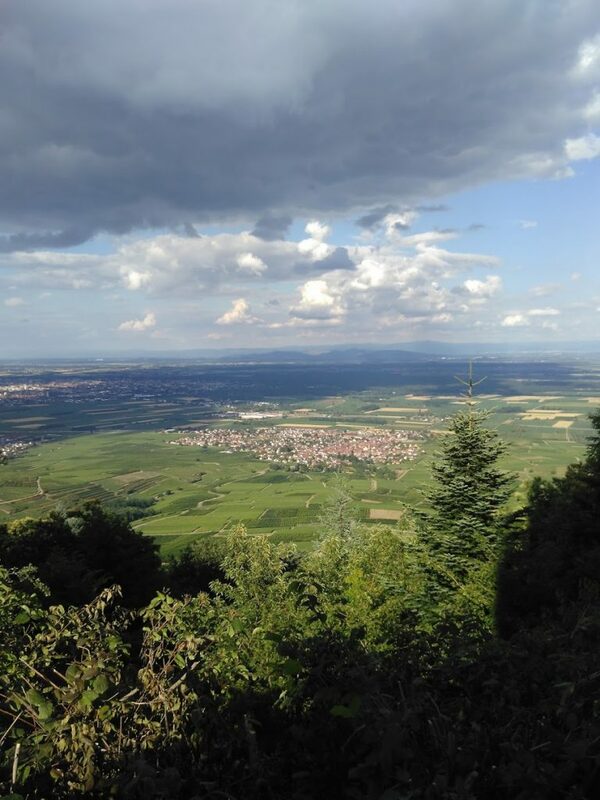 We resigned ourselves to staring out at the view of Colmar in dazed dejection at our fifteen minutes of misfortune, and took photos for a bit, because we couldn’t bring ourselves to leave. The security guy was, however, fine with us walking around the exterior of the building. After enough landscapes and selfies and group portraits and eavesdropping on the sorrows of other rejected hikers, we were feeling energetic again. 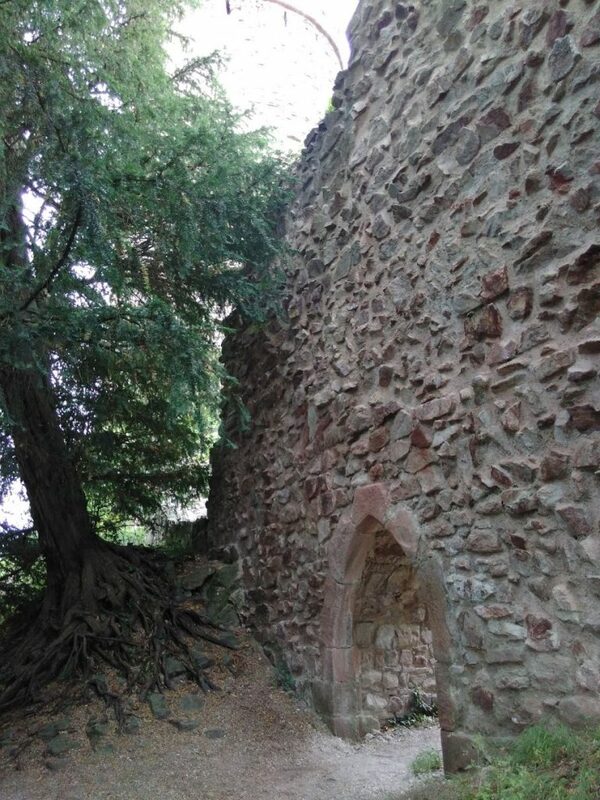 We scrambled up an informal trail and started our tour of the walls. Honestly I think we had more fun scrambling around the perimeter of the castle than we would have had if we’d been let inside. We never would have circumnavigated the place if it hadn’t been our only choice. 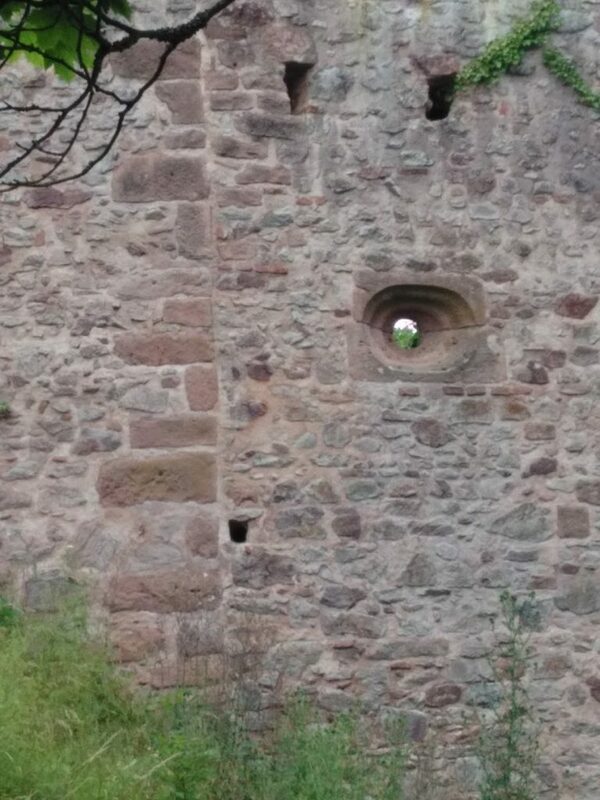 Me, looking into an arrow slit of the Forbidden Castle. 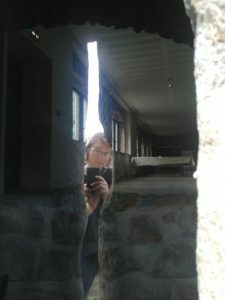 There is glass behind this particular slit, hence my reflection, but you can see into the meeting space that’s been created within. Two more castles still to come in this series. And for those who are wondering, all the photos in these posts are mine, all rights reserved. See the copyright notice in the sidebar. 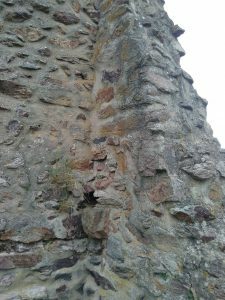 Castles tend to be built in sets, it turns out. 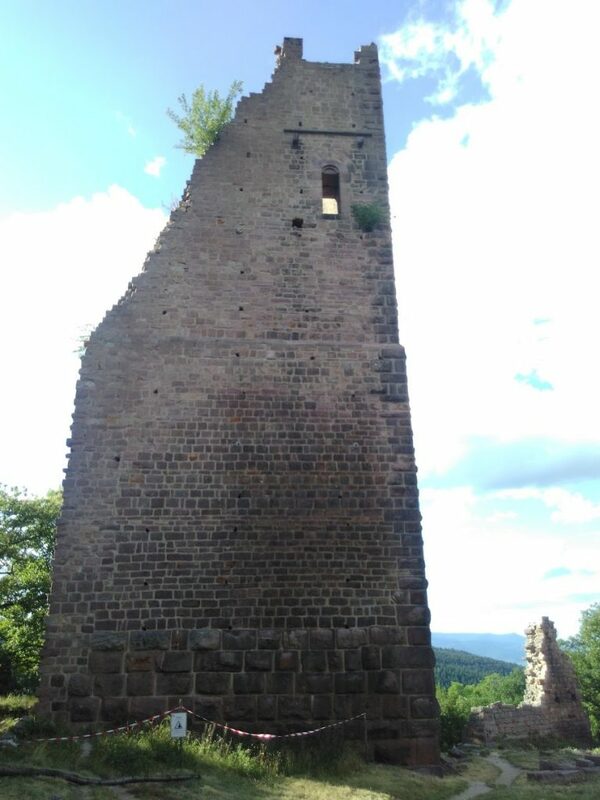 The first group of ruins we visited were the three castles above the town of Ribeauvillé. 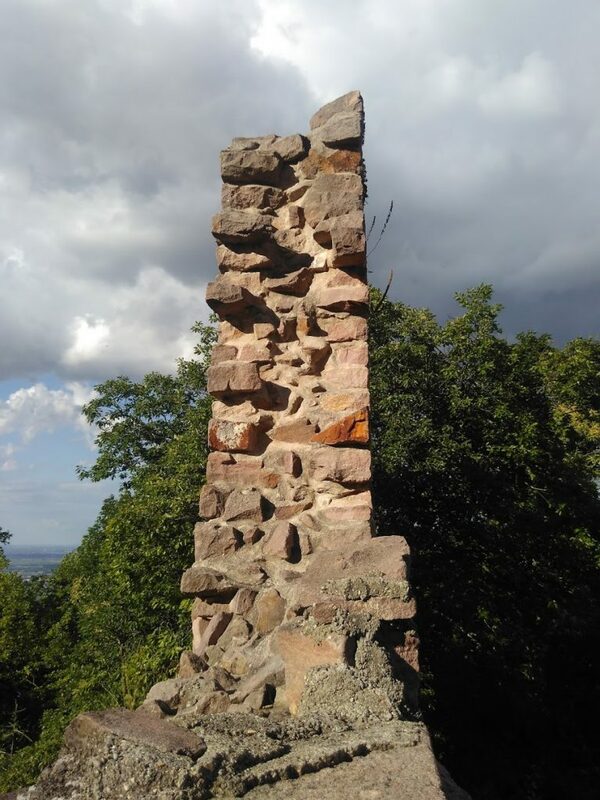 You park at the base of the mountain and walk up through the woods, and though the trails are well-marked, if you aren’t sure which trail you are supposed to be following, that can create a nagivational difficulty. But we eventually got to all three. 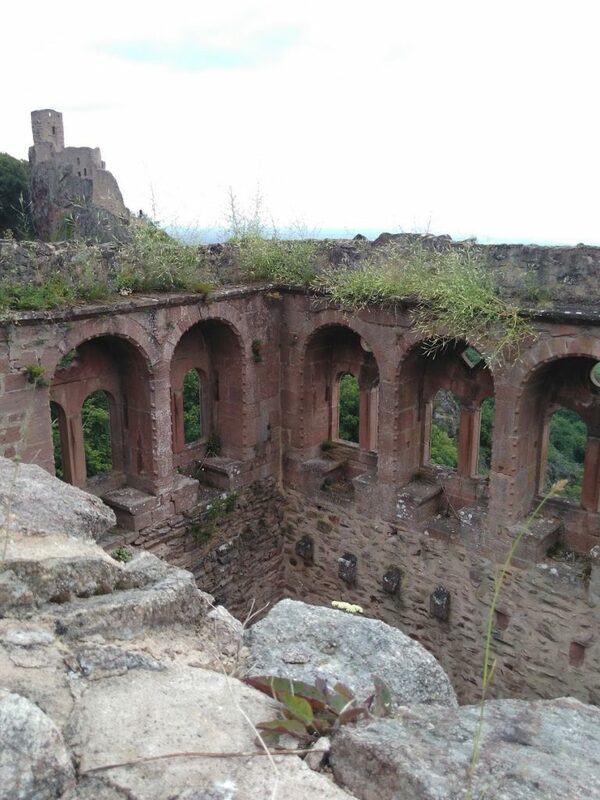 St. Ulric is next to Giersberg, and you can go inside and climb all over the place. We did that. Here are details from above and below of that room full of windows. You can see where timbers were supported to make a floor. 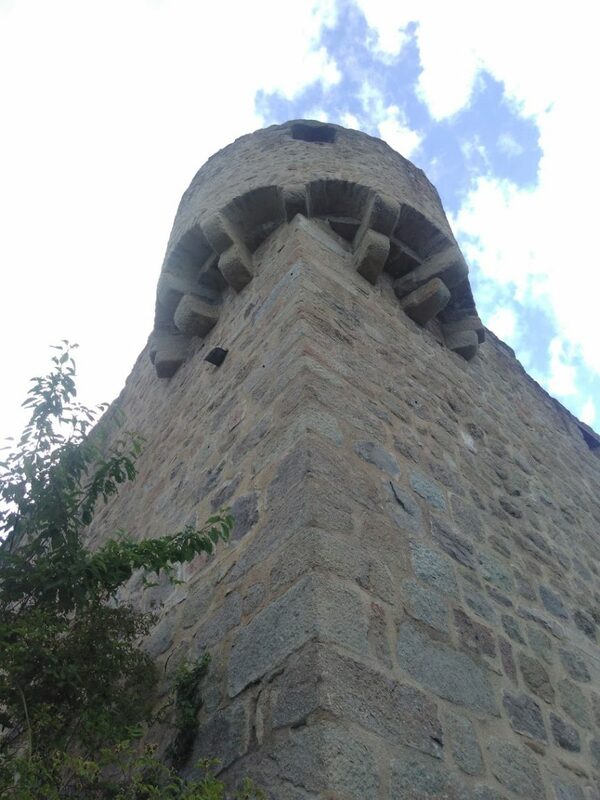 This is a view looking up to the main tower from within the castle. 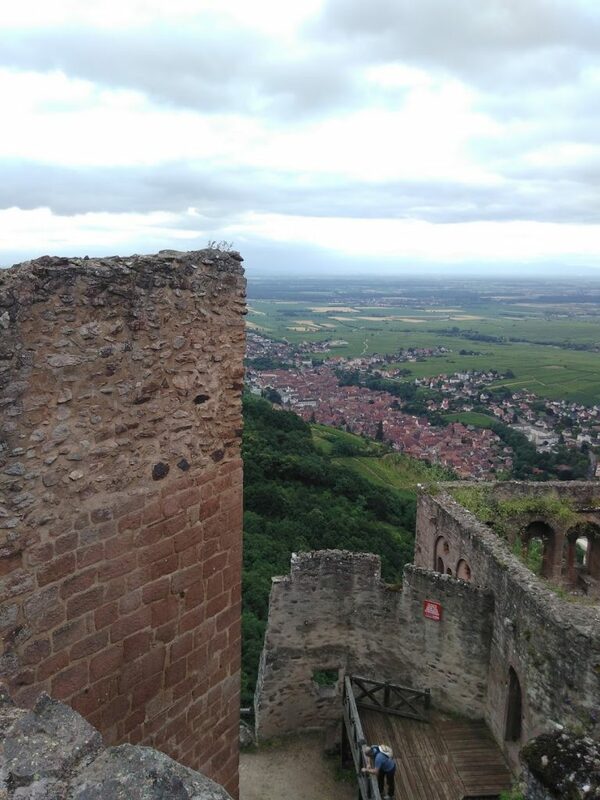 Here’s looking down from the tower into the valley. 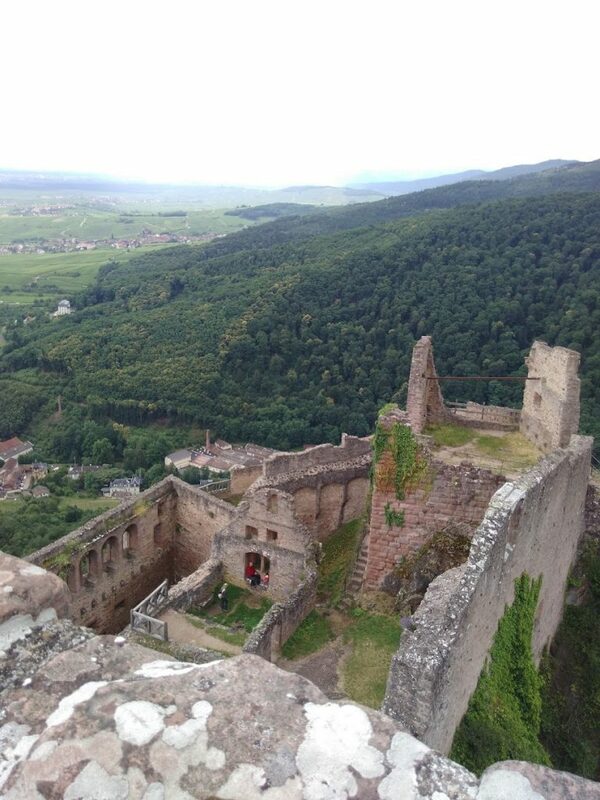 And here is looking down from the tower into the other parts of the castle. Here are wall details. You can see there are multiple construction techniques going on over the years. 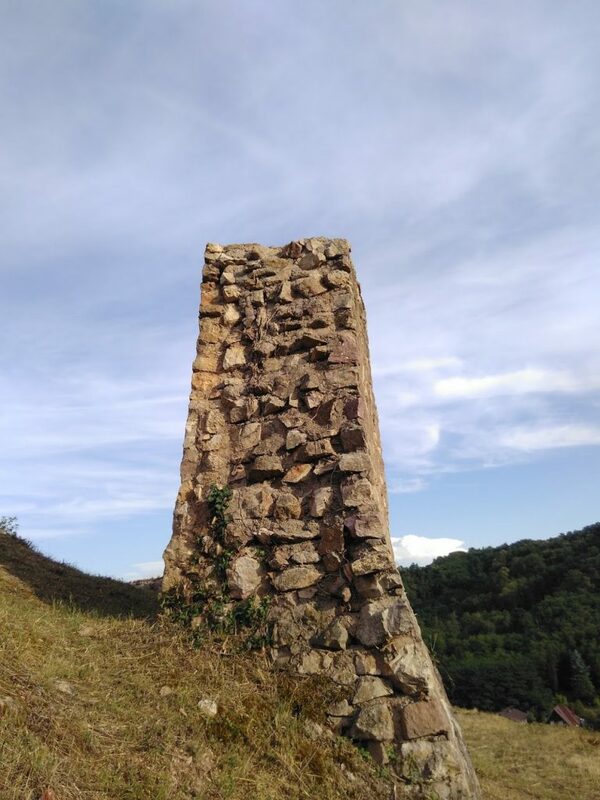 After that we took the wrong trail towards Haut-Ribeaupierre, but quickly figured out that going down the mountain was not going to gain us any elevation, and turned around and picked the correct trail the second time. Yes, I walked all that! I know! Part 2 of the Alsatian castle tour coming in the next post. 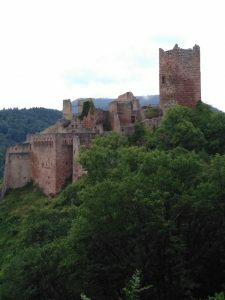 *Tourism tip: An advantage of visiting Alsace during June or July is that you have until nine or so to be off the mountain each evening, which means you can head off on a hike anytime you see something interesting as you’re driving home from your main event activity that closed down at some civilized hour. FYI this practice can interfere with dinner. The Annunciation should be a bigger feast than it is. The chocolate chip cookies at lunch were especially good, but I assure you I say this for theological reasons. I mean seriously, kids: It’s the Annunciation! It’s the re-beginning of EVERYTHING. Sheesh. Festivate! Also: St. Ignatius is the man. More also: We’ve got some mighty good priests in this country. And that’s all for now, back to the feast. Have a good one! Wikipedia, by the way, has a nice article on the word suscipe. We are fortunate to live in a diocese where good design is flourishing. I don’t for a moment wish to naysay any of the hard work and sacrifice that went into creating these beautiful new buildings. On the contrary — I am grateful beyond expressing. But let’s not delude ourselves: The very existence of some (not all) of this new construction should be an elegant, delightful, but shocking warning sign. Let’s look at St. Mary’s as a case study. The original St. Clare’s chapel, now devoted to perpetual Eucharistic Adoration, was succeeded by the first St. Mary’s Help of Christians parish church early last century. You can read an insightful history of Catholicism in the region — dating back to the 16th century — here. The historic St. Mary’s parish church is still in use. It wasn’t replaced because it was no longer habitable. It was replaced because there were too many parishioners to fit into the building. This sounds like a good problem, right? It is, in a way. It would be more accurate, however, to say: There were too many parishioners for the number of priests. The Catholic population in Aiken, SC, as with the rest of the diocese, has grown significantly due to retirees moving south (we get your empty church parts to refurbish our buildings), professionals moving here from other parts of the United States, immigrants arriving from around the world, a certain number of conversions, and of course old-fashioned human reproduction. Some of this represents spiritual growth; some of it is just other parts of the world sending us their Catholics. But regardless of the cause, an unavoidable fact is now set in stone, brick, and concrete: We are not producing priestly vocations in adequate numbers. The Diocese of Charleston has a good vocations program going. There’s always room for taking any initiative to the next level, but over the past twenty years the diocese has gotten conmendably serious and hard-working about reaching out to would-be seminarians. We do have vocations flowing. We have some superb new priests, and more on the way. Fr. Jeffrey Kirby didn’t receive the state’s highest civilian honor for nothing. Still, the arithmetic doesn’t lie. Some parishes are on fire with the faith. Some Catholics — in every parish — are wildly in love with Jesus and have the fruit to prove it. But mostly we have to make larger buildings because we have pewsitters who love the pews, but who wouldn’t want to get carried away with any craziness. Catholicism is legit here these days. Church-going is civilized. If you’re nicely married, it’s a wholesome place to raise the kids. If you’re not even Catholic, you are highly unlikely to become a Catholic priest. For as long as I’ve been talking to catechists and faith formation leaders, the refrain has been the same: “The kids in religious ed don’t even go to Mass.” Some do, of course (mine, and quite a few others I know), but a surprising number of children are dropped off for CCD but never taken to Mass. The situation is so dire that some parishes have resorted to requiring children preparing for sacraments to provide hard evidence they attend Sunday Mass, such as getting a bulletin signed. Here’s another example by way of a personal story. My daughter’s would-be confirmation sponsor is an ardent young Catholic well known by many in the local Catholic community. As we put together paperwork, however, we discovered that due to an oversight when the family purchased a new home, they are not presently registered at the parish they attend most. We’ll get it all straightened out one way or another, don’t be scandalized because there is no scandal. But the underlying situation is this: It is now the rule that the way we “prove” someone is a “practicing Catholic” is via a set of papers and financial transactions. Get registered, turn in collection envelopes, and you qualify for a “Catholic in Good Standing” letter. The idea that one could simply be a faithful Catholic known in one’s community is utterly foreign to the present practice. What if you trusted people when they said the godparents or sponsor were good Catholics? We have come to fully expect people would outright lie as a matter of course. Thus we live with a different set of lies. We as a Church are so alienated from any sense of real community that we depend on bureaucratic proxies that supposedly indicate a practice of the faith, but everyone knows that they don’t. Everyone knows that teenagers go through confirmation to make their parents happy, and then drop out at first opportunity. Everyone knows that the confirmation class is composed of kids who last attended Mass at their First Communion. Everyone knows that when we teach the Catholic faith assiduously, the kids whisper to themselves, right there in class, which parts they think are bunk. The parts they think are bunk are almost invariably the parts their parents likewise think are bunk. The Catholic Church is the stronghold of people who know how to shut up, smile, and get along. Any student of Church history can attest that things have always been shockingly bad. The behavior of Catholics is the incontroveritble evidence that God must be holding this institution together, because it sure isn’t us. That is not, however, an excuse to keep on behaving badly. I write this today because I’m concerned that our beautiful new buildings will lull us into continued complacency. We will persuade ourselves that what we’ve been doing is working. The buildings themselves cry it out. We shouldn’t have mega-parishes. We should have enough priests that when the parish overflows, we’re ready to form a second parish nearby. The lack of priests isn’t some mystical aberration. God isn’t suddenly pleased with the idea of men exhausted from administering multiple parishes and saying half a dozen masses in a weekend and having to rely on collection envelopes to know who comes to Mass because they couldn’t possibly meet all the parishioners they are supposed to be pastoring. Nonsense. We have no priests because we are very good at getting along and forming lovely clubs, but we are terrible at being Catholic. If we don’t change this, St. Mary’s beautiful new building in Aiken will enjoy a brief sojourn as a Catholic Church, and then go the way of Sacred Heart across the river, no longer a church, now just a lovely but Godforsaken building. What is this “Personal Relationship with Jesus” Business? Twice in the past month men I know, good solid Catholic men who run circles around me in the holiness business, have mentioned in passing that they’re not so sure about this “Personal Relationship with Jesus” stuff. Larry Peterson did it here, and Tom McDonald did it here. Both articles are worth reading on their own merits. These are not wishy-washy lukewarm Catholics. These are men who have counted the cost of discipleship and have stepped up to pay it. Both articles ran on Aleteia (which site I recommend — loads of good stuff), where Judy Landrieu Klein answered the question back in April with an unequivocal Yes: A “Personal Relationship with Jesus” is indeed an authentically Catholic concept. Because the question is still being asked, I’d like to answer it as well. What kind of relationship do you have with a person? To be human is to have a relationship of some nature with three divine Persons: God the Father, God the Son, and God the Holy Spirit. One God, three Persons in God. You might have an antagonistic relationship, a numb relationship, or a sorely neglected relationship, but you’ve got something. To be Catholic is to acknowledge, even if you don’t realize you’re doing so, that God isn’t some vague cosmic force or a misty feeling or a set of good thoughts. God is Personal, period. You literally cannot be baptized without acknowledging the Personhood of God. Persons, even when it’s a Divine Person and a human person, are made to have relationships with one another. The question I think many Catholics struggle with is partly linguistic and partly practical: What should we call our relationship with God, and what should it be like? Do Protestants own all the words? Catholics used to be people who borrowed words shamelessly. Need a word to describe what a “Church” is? Hey, look, there’s a Greek word that we could use to get us started, grab it and run! Large swathes of the Catechism are littered with words that Catholics picked up off the sidewalk and put to work in ways those words weren’t previously used. 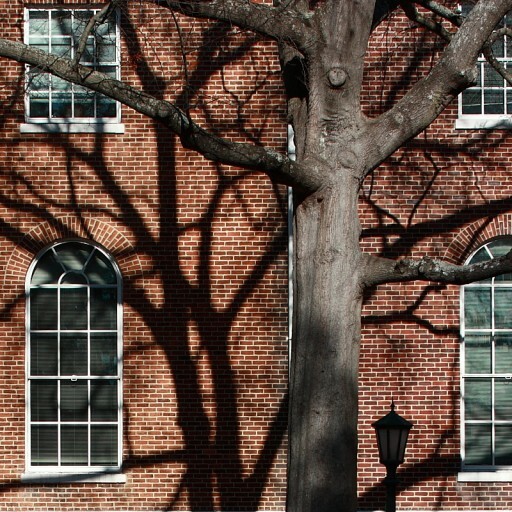 Like the Greeks and Romans and even those pagans who lent us the word “Lent,” American Protestants have a few useful expressions of their own. The concept of a Meat-and-Three restaurant, not to mention Macaroni is a vegetable! come to mind, but we’ll stick to theology for today. A “Personal Relationship with Jesus” is a phrase used heavily by American Evangelicals, sometimes beautifully and sometimes in ways that make you suddenly remember there was another county you needed to be in right now. But they are words that, when used rightly, do in fact sum up Catholic spirituality. They are words that we now find helpful, in this era when many Catholics do not believe in the doctrine of the Trinity. They are words that counteract the pseudo-spirituality that infects the Catholic Church and reduces the reality of the Incarnation to supposedly-edifying legend. Where do I find this in Catholicism? May I recommend you purchase a copy of the old four-volume edition of Butler’s Lives of Saints? The writings and lives of the martyrs and mystics are soaked through with the intensely personal nature of a well-formed relationship with God. When we speak of knowing, loving, and serving God, we aren’t speaking of rendering obeisance to some distant overlord who wants us to pay tribute. We are speaking of Someone who knows us entirely inside and out, and who wants to be known by us. Someone who chose to suffer grievously that we might again be able to walk in the garden together. The concept of a “Personal Relationship with Jesus” is specifically about owning the Incarnation. Our Lord didn’t appear in the Heavens on His Throne and zap the world clean from a dignified distance. He took on human flesh that we might eat with Him, and care for Him, and lay His body in a grave. God seeks intimacy with us. Can poetic prayer be personal prayer? It can be hard to say out loud the things we feel most deeply. One of the hallmarks of the Catholic liturgy is that the Church gives us the words to express what we would say to God if only we knew how. When we purchase a greeting card at the grocery store, we don’t have too much trouble with this concept. We look through the racks until we find the right words for the occasion, the words that best fit the relationship between ourselves and the recipient and the event at hand. Yes! That one says what I’d like to say! When we receive a card, we are moved by the sentiments if we know they come from a loved one who is genuine in sharing the humor or well-wishes or tenderness of the ideas in the card. But we live in an age with very little poetry, and which often mocks the beauty of previous generations’ rhyme and meter and melody. We can accept the idea that we might be truly expressing ourselves in the greeting card or when we sing along to a pop song on the radio, but somehow many of us have been deceived into believing that we our unworthy of higher art. We’ve been persuaded that too-beautiful words aren’t capable of being our words. The law of prayer is the law of belief, and if we pray the Our Father or the Glory Be convinced that somehow these are words too high for us, too mighty for us, we’ll come to disbelieve the Incarnation. We’ll persuade ourselves that Bless us O Lord is the herald’s shout to Jesus on His Celestial Throne Who Can’t Be Bothered To Get Any Closer, not the simple few lines of people wishing to pause before eating to say a word of personal thanks to a Person who literally dwelt within our very bodies the last time we received Holy Communion. This heresy is at the heart of our liturgical wars: It is it only “authentic” prayer if it’s folksy? Or is God so august that we must never approach the throne of grace with anything but fear and trembling? It’s a false dichotomy. In the liturgy I’m a child learning to say grown-up words. God the Father wants to rear me for His Heavenly Kingdom; God the Holy Spirit breathes supernatural life into my feeble attempts at prayer; and the God the Son is both there at table for me to lay my head upon His breast and raised to the great high throne in majesty. My relationship with Jesus is personal because Jesus is a Person. I grow in that relationship the more completely I embrace the entirety of what Christ is. God humbled, God crucified, God glorified. All of it. Today’s topic is important enough that I’ll be cross-posting it at Patheos as well. Share from whichever venue you prefer. Per my standard policy on blog posts, parish and diocesan publications have permission to reprint at no charge, please provide a link back to the original in your attribution.